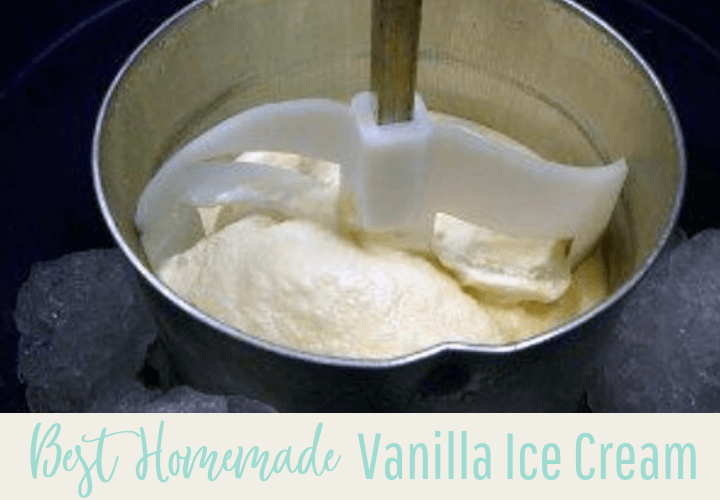 Homemade vanilla ice cream is a warm-weather dessert that usually shows up for cookouts and Sunday School class parties. We made three freezers of homemade ice cream for a rehearsal dinner in a barn a few years ago and it was a big hit. We usually only make it 3-4 times a year, so it’s a special treat. This recipe was given to me years ago by my husband’s aunt. I know that some people are squeamish about eating raw eggs and I understand that. They’ll probably want to search for another recipe. Combine whipping cream, eggs, vanilla and sugar with an electric mixer. Mix until eggs are blended in. Pour mixture into a 6-quart ice cream freezer canister. Pour milk into mixture until it reaches the fill line on the canister. Insert dasher, place lid on the canister. Put the canister in the ice cream freezer bucket (set in a dishpan in the sink or on the ground). Layer ice and rock salt generously. Pour a cup of hot water over the top. Plug in to start the freezer motor. Check frequently and add more ice and rock salt. When freezer stops, unplug and remove the dasher (otherwise it will get frozen and stuck!). Replace the lid and put a folded towel on top. Let set for a few minutes to finish the freezing process. If you’re in a hurry, go ahead and serve. This ice cream is not too sweet and we like it that way, but you can add up to 6 cups of sugar. We usually eat it plain, but occasionally we make a peanut butter and chocolate sauce by cooking No-Bake Cookies without the oats. Yummy! Washing your eggs before you crack them helps bunches! Wash them right before you use them because warm water will draw bacteria into the shell. Raw eggs definitely make the best ice cream and I love your idea for sauce! Wow, 8 quarts! I need me one of them! I would guess that you would need about a gallon of milk because our 6-qt. uses around 3/4 of a gallon. The fill line on our canister is about 4-5 inches below the top to give room for expansion as the mix freezes. Hope this helps! What does the cup of hot water over the top do? Never heard that before! An old farmer told me to do that and it would freeze the ice cream faster. It seems to work. I’m sure there’s a scientific explanation but I don’t know what it is! I know they told us in science class in college that hot water would freeze faster than cold–but I never tried it. Maybe this is why–but I don’t understand it. Guess if it works, that’s the main thing. Thanks for the tip! It’s a 6-quart Rival. I honestly don’t know how much they are because we’ve had ours for at least 15 years! Maybe $25-$30?? The size is just right for us, because we usually have company when we serve it. Awesome. Best flavor I’ve ever had. I have a six quart from Bass Pro. Really nice machine. The hot water did seem to freeze it faster. Thank you so much for sharing this. Super easy to mix too.